Recently I found some old friends living in my laptop. Facebook has a way of shaking things up, and bringing these old friends up to the surface after being away for so long. I've learned a lot since joining Facebook. One thing I have learned is that no matter where one lives we are all subject to the same things. Family issues. Work problems. Local politics. Yep. Local politics. Tip O'Neil said that all politics was local. What he did not say was that all local politics is the same, only the address is changed. And, that is to be expected. Every community has roads that need repairing, schools that need to be built, landfills that need to be capped, and public servants that need to be paid. Every community also has individuals that feel that more could be done, that too much time is spent on the the "drama", and not enough on action, and that their community has become divided. Sturbridge, we are not alone. 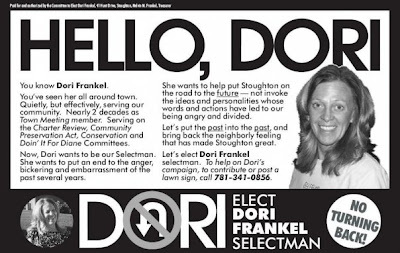 When I found out that Dori was running for selectman's office in Stoughton, I smiled and said to myself, "The more things change, the more things stay the same". She never could sit and watch. She liked to be involved. One can only take so much, before one chooses to act at a particular level. 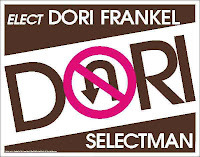 I guess Dori has had her fill, and is going for it. I wonder who, in Sturbridge, will step up this year, and run for selectman? Will we hear from a frustrated, new voice here in town as Stoughton has? I hope so. Every chorus needs new voices.